The Peterson Automobile Museum sits at the intersection of Fairfax and Wilshire Boulevard in Los Angeles, next to LACMA and the La Brea Tar Pits. With its exterior curving facade, the building stands out from its neighbors. Relatively young, the museum opened in 1994 and remodeled in 2015. This was when the facade was added along with changing galleries. As soon as you enter the museum, you encounter your first car, a custom low-rider. Though, car museums pepper the country, mostly built from one man’s personal collection, just like this one. Peterson’s presents the cars as beautiful and well-designed objects, but most cars also celebrate Southern California car culture. Unsurprising considering the founder and namesake launched and ran Hot Rod magazine. The experience begins at the top—on the 3rd floor. The theme of this floor is History, and the exhibit starts with one of the first automobiles, the quadricycle, but quickly moves on to variations of the car and our desire to both customize and make the car faster. One section features the cars of Hollywood and includes celebrities cars and cars used in movies, like the Volkswagen Beetle used in Herbie the Love Bug, the Delorean used in Back to the Future and the Batmobile. Moving down to the 2nd floor, Industry, smaller exhibits focus on car design, production, and sub-industries. In a special exhibit, you see the evolution of the Ferrari (and with the cars positioned next to each other you appreciate variations to the iconic red). Also, you learn about the history of methods to power a car, from gas to electric, to steam, to solar power. The important takeaway here is that gas has never been the only way to power cars—it is simply the most prevalent method. Back on the first floor, the last portion of the museum is devoted to Beauty. Here, you move from one expansive gallery focused on the history and inspiration of Bugatti to a smaller gallery featuring lowrider cars and art inspired by the culture. Overall, interpretation throughout the museum is pretty light, or it may feel that way because the objects are so large they dwarf any object labels. Larger gallery introduction panels appear interspersed throughout the floor. But it may take you a minute to realize you are in a new section of the exhibit because the space becomes mostly open. Large-scale graphics or projections are often displayed on the walls behind some of the cars, hinting at the car’s original environment or use. Because of the light interpretation, the people—the designers, the owners, the manufacturers, the aficionados—take a back seat to the cars. So though you can admire the design, the craftsmanship and the drive to build the best, the fastest or the most stylish car, you rarely hear from those whose hands shaped the curves of the bodies, or the industry, or the history of the automobile. Only one small section of the 2nd floor is set aside for the professionals to speak for themselves. But this small exhibit, simply titled Industry Professionals, does not entice visitors—either through the name or the space. Eight cubicles are spaced on a wall, four on either side. 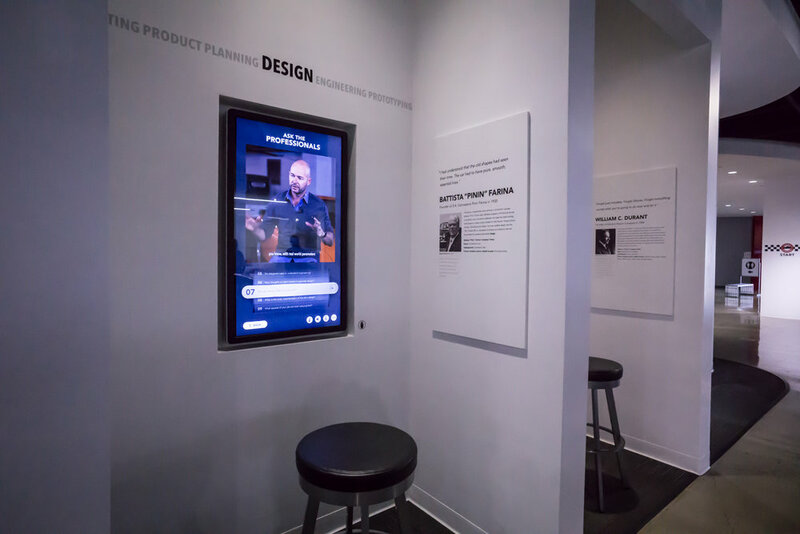 Within each nook, a touchscreen mounted vertically and features a person representing a role like Prototyping, Engineering, Design or Product Planning. It’s easy to assume that this was designed to create a sense that you have an intimate conversation this professional. On the screen, you select a question and watch the person respond. Questions touch on process, teamwork, important parts of the job, and often, the responses feel incomplete. For the designer, when asked to describe the process, he mentions the use of models and the importance of physical models. What you miss hearing is any real insight into where he draws inspiration, or how he reconciles his designs with an engineer’s calculations for the car. Peterson’s has set up an environment, an experience, to encourage a connection between the visitor and professionals, but fell short on the delivery. It failed to reveal the motivations and real personalities of these professionals. Someone has to have an unusual process or spend late nights working. There must be a conflict between these professionals, and it's a shame we don’t see it. Today, with podcasts like this American Life and Radiolab and television documentaries like HBO’s Defiant Ones, listeners—who are also most likely to be museum visitors—have come to expect to hear about the real and the messy parts of a profession. Museums like the Peterson could continue to push their innovation into their storytelling and look to these mediums for inspiration. Then maybe visitors can connect with the professionals and with the exhibits and museum.